Here in the States, singer Amy Studt might not be a recognizable name. But in her native U.K., she has a track record as a pop star who came onto the scene in the early 2000s with catchy hits like “Just a Little Girl” and “Misfit” (the latter track could have been a dead ringer for an Avril Lavigne song). Fast forward to today and Studt has taken a somewhat very different tact with her latest music through the release of her recent single “Different Colour Pills/I Was Jesus in Your Veins.” The haunting and yearning “Different Colour Pills” is very reminiscent of ’60s girl-group/psychedelic rock/pop that would be not far off stylistically of what the Jesus and Mary Chain would do; the same applies to the single’s B-side, the hazy-sounding Beatlesque and slightly poppy “I Was Jesus in Your Veins.” Longtime British followers of Studt’s career might consider this transformation from pop star to mature artist a surprise, but in America, Studt would be probably seen as an emerging new artist through this single. 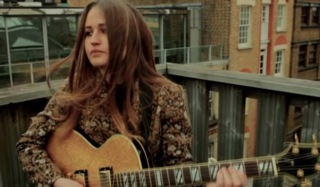 Regardless, “Different Colour Pills” is promising of things to come with the imminent release of her next album.